No. 21, Jalan SBC 5, Taman Sri Batu Caves, 68100 Batu Caves, Selangor, Malaysia. 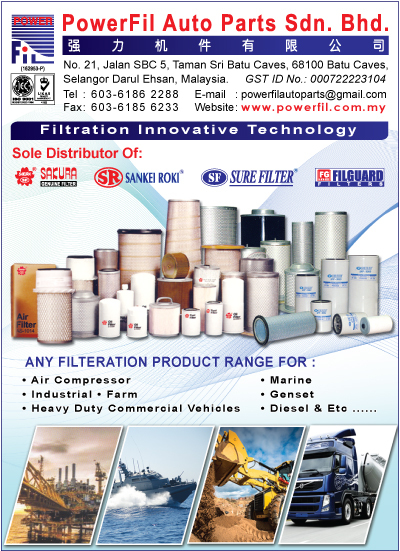 PowerFil was first established on July 1987, with its first office in Taman City off Jalan Kuching, in Kuala Lumpur, with the purpose of focussing its business in the heavy duty and commercial vehicle filtration. The emphasis has been to provide a world class quality yet as competitive as possible. filtration solutions for different segment. Later in 1995, PowerFil took up the SAKURA HEAVY DUTY line and distribute it across Malaysia as its primary product. Now, PowerFil is able to provide a very comprehensive range of heavy duty and commercial filters by a combination of local manufacturing SANKEI ROKI and FILGUARD, and imported range with major brands SAKURA and SURE FILTER on is inventory. With the essential focus of good international sourcing and focus on quality with equal emphasis on excellent after service, We believe We can provide the best aftermarket heavy duty and commercial filtration answer to needs of the market in MALAYSIA and its Regional area.